This script pro­duces an adver­tis­ing that was pub­lished in neural mag. As usual we start by defin­ing some global variables. We use a pro­cess­ing sketch that takes a svg file and draws on the path infor­ma­tion given by this file. We define the para­me­ters to exe­cute the pro­cess­ing sketch as usual. 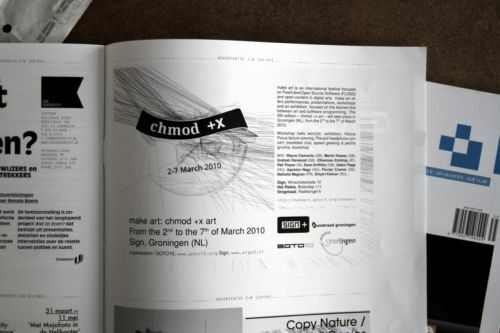 The chmod+x logo was sep­a­rated into lay­ers. The pro­cess­ing sketch now runs on every file (=layer) in the direc­tory. The out­put file­names are unique for each file (=layer) so they can be eas­ily sorted and rearranged later on. The pro­cess­ing script is called inside a for–loop, the input file­names are writ­ten into a textfile which is read by pro­cess­ing. Pro­cess­ing has ren­dered ten dif­fer­ent frames for each file/layer and out­put as pdf file. These pdf files get sorted and ref­er­enced in a list. I wanted lay­ers to be treated dif­fer­ent. Some to appear more often, and for cer­tain lay­ers only cer­tain frames (egrep '0001|00002|00003'). IMPORTANTLAYERS="5 6 6 2 2 7 7 7 8 8 8"
Layouting/Overlaying of pdf-files is done with LaTeX. Because some of the LaTeX code needs to be gen­er­ated by a script any­way, I decided to let the script write the whole tex file. Most of the LaTeX code is sta­tic, only a small sec­tion is writ­ten each time, because there need dif­fer­ent graphic files to be ref­er­enced. This is done with a for–loop. Finally the gen­er­ated LaTeX-file is com­piled with with pdflatex, given a unique file­name and moved to a directory. The script cre­ates 10 dif­fer­ent pdfs from which one can be selected accord­ing to per­sonal taste.